I have the monsoons to thank for turning me into a cook. As children my sister and I spent summer holidays with Aaji and Ajoba at their small farm in Belgaum. The front of the plain, ranch-style house was framed by a lush rose garden interspersed with almond, pomegranate and lime trees. To the left of the house was a strawberry patch, and in the backyard, a vegetable and fruit orchard. Ajoba was a proud gardener whose produce competed for and won local awards. When it rained, we couldn’t play outside so he offered us two choices – learn Sanskrit shlokas and refine the mind or learn cooking and refine the marriage resumes. The monsoons are a lean period for good produce so the months leading to it, especially May, were spent harvesting. Ours was a frugal household, and since most of what we ate during the rainy season came off the farm, we devoted salubrious afternoons to picking guavas, sapota (chikoo), mangoes and cashew apples. You will have newfound respect for cashews when I tell you how strenuous the reaping is. First, the fruit is plucked off the tree with a diabolical looking hook attached to a long, wooden pole. Then the under-hanging cashew nut is ripped off. 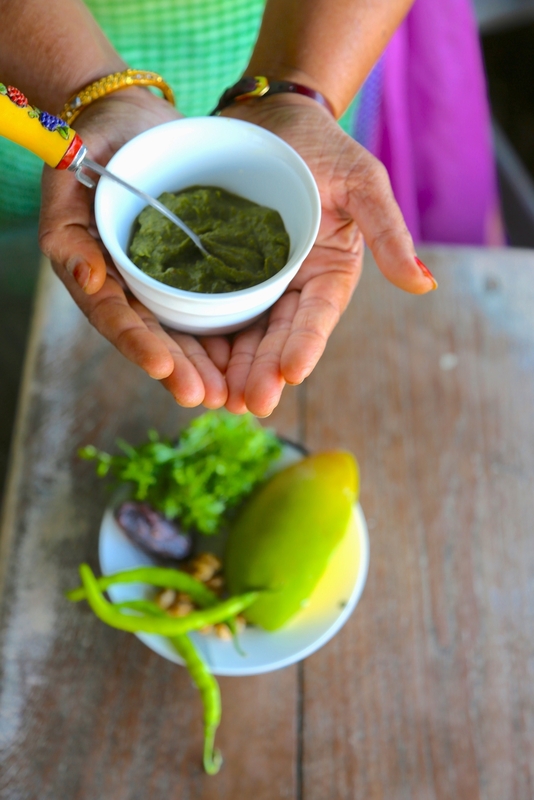 We sold the cashew apple to local feni producers, but kept the nuts. The cashew has a hard outer shell filled with a corrosive liquid. We’d slap our hands with oil and, sitting cross-legged on the tile floor, crack open every one of those 2,000 kernels to reveal a tender, crescent-shaped nut wrapped in wrinkled, brown skin. This skin had to be scraped off ever so gently so as not to break the cashew. Throughout the monsoon Aaji turned these nubile nuts into lip-smacking fried masala cashews, farasbi kaju usal, moogache kaju dabdab, a Karwari specialty of curried bean sprouts that required us to peel the green husk off every single moong bean. This was the culinary equivalent of a Navy Seal training camp. Flame red seedless papayas, (Ajoba called them disco papitas) grew abundantly, as did videshi panas (breadfruit), a meaty fruit Aaji sliced into kaape, dusted with semolina and pan fried. Among the many bananas Ajoba grew were the small paper-skinned cardamom-scented Safed Velchis of Maharashtra, Karnataka’s highly-prized Chandrabale red bananas, and the unique Nanjangud (it received protected geographical status in 2005). They were whacked off early and hung up to ripen in ponderous bunches from a disused four-poster bed in the verandah. We took afternoon naps with our adopted stray dog, Brandy under this canopy of carbohydrates. Soft sunlight, a doggy to cuddle and the heady fragrance of sweet bananas made for excellent siestas. These bananas were turned into hot fritters, halwa and banana dalchini jam. And you haven’t lived until you’ve eaten a caramelised banana jam slathered over homemade white butter on a slice of Swamy Bakery’s coconut bread. The pride of Ajoba’s garden, however were his mangoes. Some Badami, Raspuri, Totapuri but mostly Langda, the north Indian transplant grew inexplicably well in his garden’s black soil. Belgaum is disputed territory, claimed by both Maharashtra and Karnataka. Ajoba, who was Marathi speaking, grew varieties of fruit from several states to please his palate and his patriotism. This resulted in delicious politics, the source of which was our maali, Ratan kaka. He had spent much of his life around vegetables that he’d acquired their qualities. A face as shriveled as bitter gourd and gait as curved as a marrow, he was a walking and mostly cussing, hybrid. But he had veggie magic. Like some potion-brewing druid, he could talk to gourds, resurrect tomato vines even bring brinjal back from the dead. Such talent is alas also opinionated. Kaka turned his nose up at any produce that wasn’t Kannadiga and because he was born in Maharashtra he was willing to make exceptions for Konkan breeds. When we asked him why Ajoba’s favourite mango was called Langda, (the word means lame,) he explained it was the deformed, treacherous, less good-looking brother of Hapus. Aah, the mango family is ruthless I’d thought, but in fact it was kaka. He despised Langda. Ajoba had forbidden him from growing Alphonso. 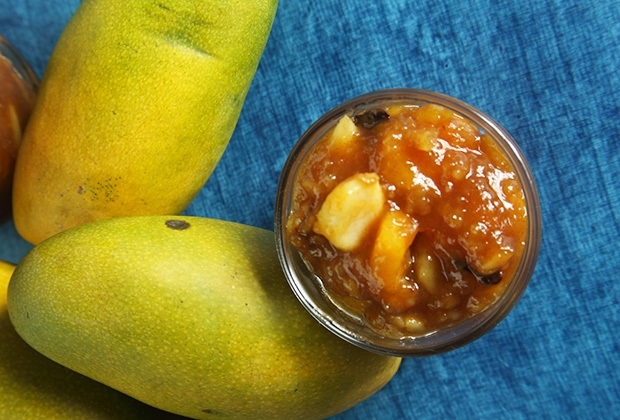 Kaka, who was originally from Ratnagiri, the home of Hapus couldn’t abide this lesser-known mango when by birthright he should have cultivated the King. If the guavas were pitted, maali blamed Langda for poisoning the soil. If the strawberries were not sweet, it was Landga’s fault. Ajoba showed staunch loyalty to the Langda. The graft was a gift from a close friend and a happy reminder of his days in Delhi. “They have far more character of flavour,” he insisted. But, there was a deep and dark secret the prize-winning cultivator didn’t want anyone to know – Hapus simply wouldn’t grow in his garden! So, Badamis and Raspuris were turned into aamras, served with saucer-like puris that flew out of Aaji’s kadai onto our plates at the speed of light. Mangoes were also turned into pickles – methamba with fenugreek, sakharammba with saffron and my favourite, garlic and mango lonche. While Langda was reserved for ice-creams and chilled soufflés. I’m convinced that the Marathi words ‘salsaleet’ and ‘zanzaneet’ were created for foods eaten during the monsoon – when it’s cold and wet outside you warm up to a sizzling, spicy dinner inside. I remember we’d race up the hillock behind the farm to collect ‘Dongrachi Kali Maina’- the black nightingale of the rocks also known as Karvanda, a fruit that thrives in dry weather on prickly bushes. Wet, our clothes stained red by luscious berries we’d return home for a meal of baby eggplants stuffed with gode masala and steamy jowarichi bhakri. I remember my fingers, tender from the thorns tingling at the touch of those spiced eggplants. In the monsoons you literally fritter away your time. Love of deep-fried snacks is a genetic Indian syndrome and resisting them is like trying to medicate for a common cold. Give in gracefully. Onion bhajjis, crisp on the outside soft on the inside, and fragrant milk tea with pudina and ole chaha (lemongrass stalks) are irresistible on rainy days. Aaji battered up a plethora of bhajjis and pakoras, rice flour chaklis, twisty kodbale, crunchy muduku, sweet corn vadis dotted with green chilies and mounds of masala sev. She also made delicious guava jam and poached guavas, but it was her guava Sasav with prawns that stood out. Sasav, a thick, sweet and spicy curry that’s utterly delicious over boiled rice is a Saraswat specialty traditionally made with Kala Ishaad mango. There was also a specialty called ‘shevra‘, or dragon stalk yam, which was chopped and stir fried with a rai-hinga phodni (mustard and asafoetida tempering), colocassia leaves were turned into alu wadi and baby methi was tossed with baby potatoes. Interestingly, the monsoon brings several bitter vegetables to the table. Karela or bitter gourd, ambadi, chakwat, chuka, red and green Amaranthus leaves called Maath and Kardai (safflower) were all sautéed, turned into usals, rassas, palya bhajis, koshimbris or stirred into lentils and Shevya (vermicelli noodles). The monsoon months of my childhood were intense lessons in cooking, eating and being blissfully happy. My marriage resume thus fortified, I married a nice American boy from Minnesota. Ajoba would be relieved to know he loves Langda. Thathastu. This is more a relish than a pickle and is excellent with pulao, bhaat, curd rice, plain flatbreads or a vegetable dish. It’s also excellent with cheese and crackers, roast chicken and grilled fish. 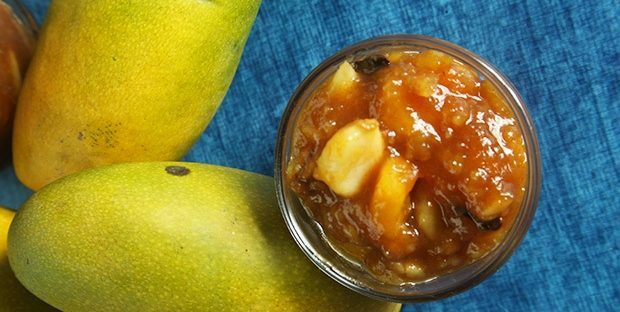 You can use a variety of mangoes for this recipe. Use mangoes that are still green and firm but avoid the totally raw, hard kairis. 1. Wash the mangoes. Grate them with the skin on. Discard the seeds. 2. Steam the grated fruit and chilli flakes for 5 minutes in a pressure cooker, rice cooker or steamer, without water. 3. Boil the sugar with 1 cup of water in a pan till thick and syrupy. Swirl pan if required but do not stir. Do not let the sugar brown. 4. Stir in the garlic and cinnamon. Continue cooking. 5. When the syrup is very thick, add the grated and steamed mangoes. Cook on high heat, till thick, swirling periodically to prevent burning. 6. Remove from heat and add salt and a little water if you prefer a thinner consistency. 7. Bring to a boil on high heat, reduce heat and simmer again for 8-10 minutes until thick and bubbly. 8. Remove the cinnamon stick. Bottle in a clean, airtight, sterilised jar while the relish is still hot. 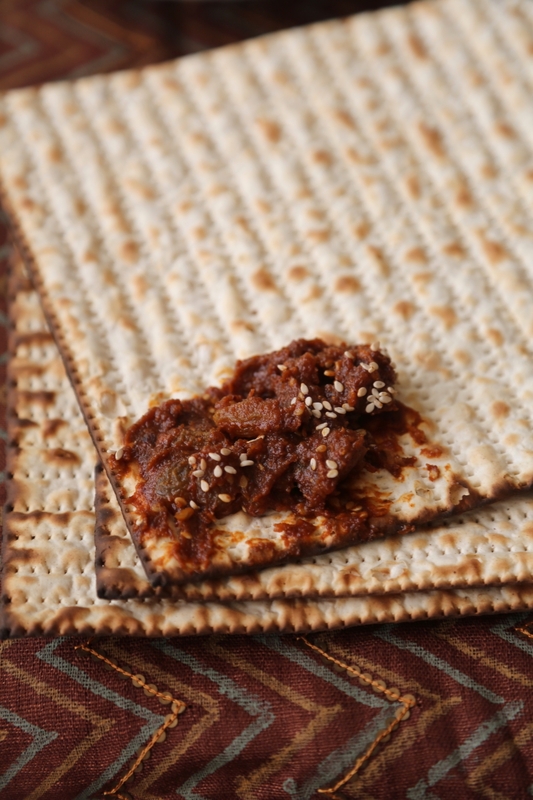 A delicious sweet and spicy chutney thats made during Passover for the seder meal by Cochini Jews in India. Its also lovely with wine cheese and crackers. I eat it with curds and rice too! PUT THE DATES AND A ½ TEASPOON OF SALT INTO A SAUCEPAN. ADD ¾ CUP WATER AND COOK TO A BOIL UNTIL MOST OF THE WATER HAS EVAPORATED. MEANWHILE TOAST ¼ TABLESPOON SESAME SEEDS IN A DRY SKILLET ON MEDIUM HEAT UNTIL TOASTY. RESERVE. TOAST REMAINING SESAME SEEDS, RED CHILLIES IN THE DRY SKILLET UNTIL TOASTY. COOL AND GRIND TO A SMOOTH POWDER. CHOP HALF THE COOKED DATES. RESERVE. GRIND THE REMAINING DATES AND GROUND SESAME AND SPICES TO A SMOOTH PUREE. STIR IN THE WALNUTS, APPLES, RAISINS AND CHOPPED DATES. ADJUST FOR SALT. GARNISH WITH REMAINING SESAME SEEDS. 1. Heat 2 tablespoons of oil in a small skillet or tempering spoon on high heat. When oil is hot but not smoking reduce flame to medium. 2. Temper the curry leaves, cook 30 seconds until they look crisp. Drain and reserve. Add more oil, when hot temper the Bengal gram about 30 seconds, drain and reserve. 3. 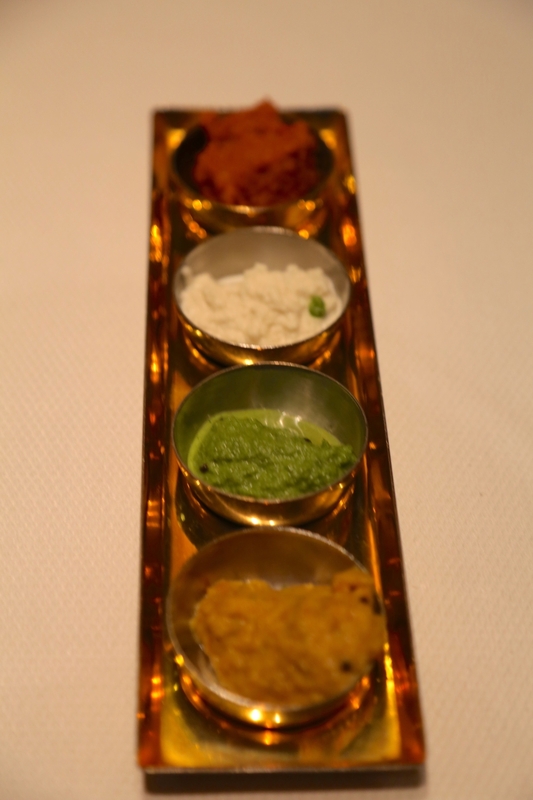 Grind together the curry leaves, Bengal gram, green chillies, grated coconut, tamarind and salt to a fine paste. 4. Temper the chutney with oil, mustard, split urad dal, and curry leaves, Madras round chillies and hing powder. 5. Mix the tempering to the chutney, check seasoning and serve. Grind all the ingredients to a smooth paste. Taste for salt and sweetness. Adjust. Keep refrigerated in an airtight container. 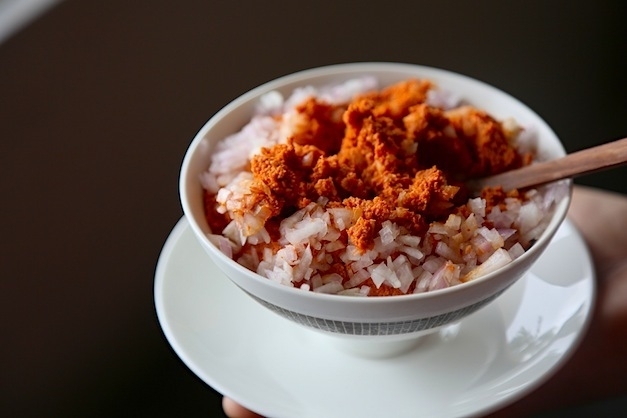 A coastal Indian classic from the town of Karwar, 2 hours from Goa. The chopped raw onion garnish is typical of dishes from this small coastal city. Serve with fritters, dosas, poles, poori bhaji, thalipeeth and idlis. I recall some of my relatives added cumin seeds to this chutney, others omitted the garlic but the chopped raw onion was a permanent feature. Its important to grate the coconut so it grinds to a paste quickly. This prevents the oil from separating from the coconut meat. Toast the red chillies in a dry skillet on medium heat until fragrant about 2 minutes, stirring from time to time to prevent the chilli skins from blackening. Cool completely and grind to a smooth powder. Combine the tamarind, garlic, a teaspoon of salt, the powdered chillies and freshly grated coconut and grind to a smooth paste. Add a few drops of water from time to time to facilitate grinding but not too much as this is a thick chutney. Taste for salt, spiciness and tamarind. Adjust to your taste if required. You can add more red chillies if you want it hotter, more tamarind and salt too. This is a delicious spread for toast, muffins, waffles, pancakes and cornbread. It's even great with crackers and cheese and a spoonful will liven up yogurt. Whisk it into cream cheese for a dip or frosting. Serve as a cheesecake topping. And stir in some bourbon if its a grown ups party. Maple syrup and pecans have a unique flavor. You can also use walnuts and melted jaggery to create a similar spread but the flavors will be different. Toast the pecans and 25 grams melted butter in a non stick pan until golden and fragrant. Remove from pan. Add pumpkin puree, lime zest and another 25 grams of melted butter and cook, stirring constantly on a medium flame until it reduces to 3/4 its original volume for tinned pumpkin and 1/2 its volume for fresh pumpkin. The color will darken as you cook it which is good. When nearly done add all the powdered spices and cook another 1-2 minutes. Cool. Grind pecans to a very fine smooth paste. Add maple syrup to facilitate grinding. When the paste is smooth add the cooled pumpkin and grind to a smooth paste. Pass through a sieve and discard any bits and pieces. 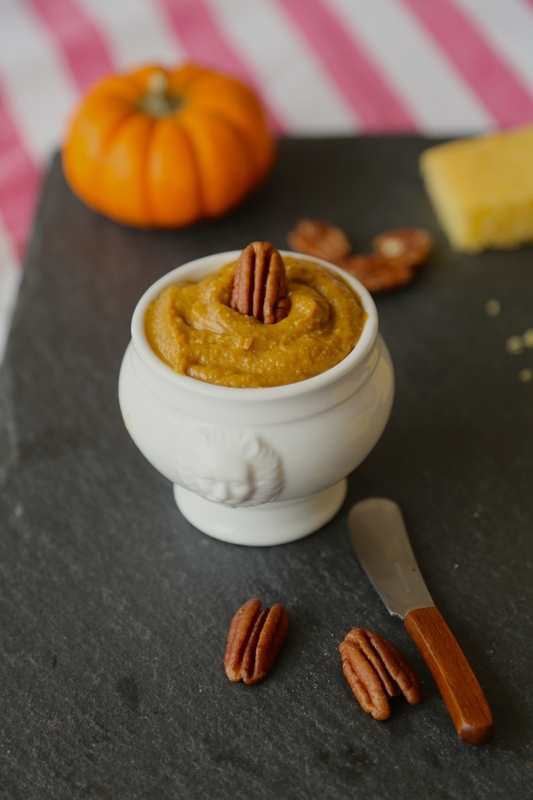 Whip this strained pumpkin mixture with 75 grams softened but cold butter using a hand or stand mixer until fluffy. Adjust spices, salt and maple syrup. A classic condiment from the state of Maharashtra. This spicy sauce gets it bright color from red chillies. While there are several ways to make it my grand aunt who hails from Kolhapur-the place of its origin always made it with fresh red chillies. 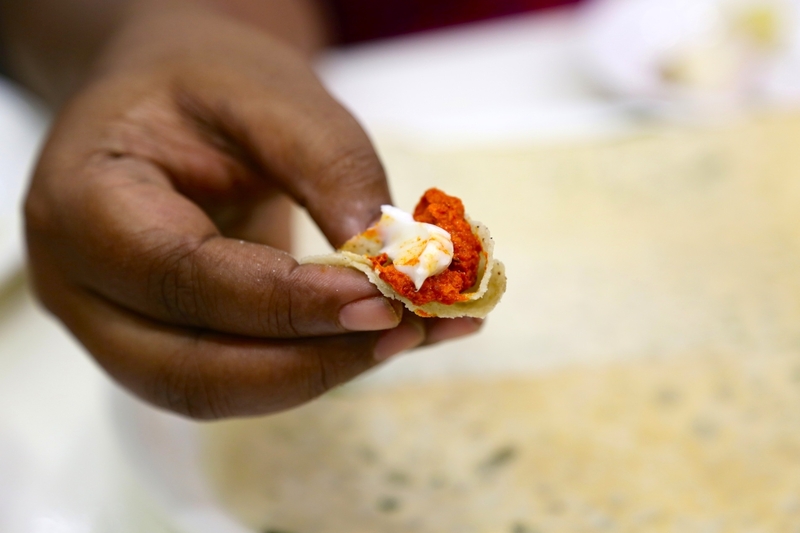 It can be served with white butter and bhakri (as pictured) various breads like thaleepeet, dosas, dals, bhareets (pulped vegetables) stirred into yogurt or labbaneh or used as a sandwich spread or hot sauce. Process the red chilies, garlic and peanuts to a coarse paste. Heat oil in a pan, add mustard seeds and cook 30 seconds until the seeds splutter and rise to the surface. Add asafetida. Then switch off flame, allow the pan to cool and stir in the chili paste. Fill immediately into a sterilized jar. Keep refrigerated in a clean air tight jar.